Monday update: Some readers have been unable to submit Comments since Thursday. Tech support is working on this. So — I will leave this post open until we get the issue solved, so that everyone can participate. Sorry for the inconvenience! 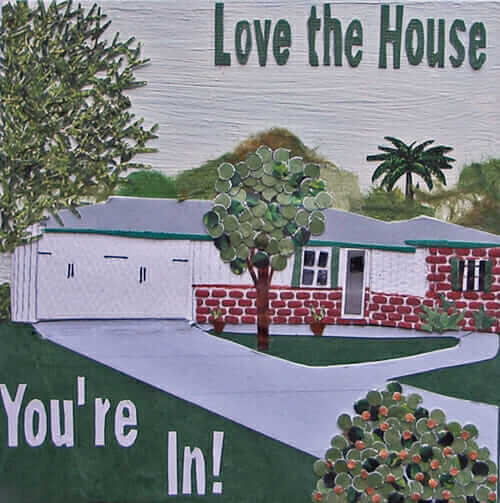 Shelly was the winner of last month’s “Love the House You’re In” custom collage by our collage artist laureate Mel Kolstad. To win our June contest: Leave a Comment sharing, “What I am doing for my summer vacation?” This contest rewards regular readers — I will pick a winner Monday morning.Please read all the rules here before entering, they all apply. What an inviting home! Shelly sent multiple views of her gorgeous home for me to use and I chose this angle so that I could incorporate all of the beautiful foliage. I love how it frames the house in luscious greens. And I love the sprawling ranch style – so very late 50s and SO lovely! This summer we’re visiting my dad in Norfolk, VA. He lives in a lovely house on a lake. After our family vacation, my 12 year old is staying on for the rest of the summer. After homeschooling all year, it’s a double vacation for me! Although I really should spend every second of any time I take off working on the hundreds of house projects–big and small–we have to do, we’re going to head up to Maine for a week with friends. Swimming, seafood, ice cream, and just hanging out. Having a toddler (plus a 5-year-old) means that I really only have about 2 hours a day (during nap time) to get anything done anyway–so I figure enjoy the kids now, while they still want to be around me, and work on the house later. The rest of the summer is about embracing the ‘burbs. This is our first full summer in our 1957 mc modern home, after 12 years in the city, and I have to say that every day when I wake up and get to look out the wall of windows we have across the back of our house feels like summer vacation–even with an hour commute ahead of me. After this crazy winter of snow, I can finally say, ahhhh, I know why I moved here. We actually had friends out from Boston yesterday for a Kick Off the Summer Day–complete with swimming at the town pond/watering hole, bbq and kiddie pool back at the house, and ice cream at the local ice cream stand with kids running around the picnic area with sticky chocolate cheeks and fingers. Kids just passed out from shear sugary happy exhaustion at the end of it all. It was great! There were a lot of odd things done to our poor little house, and we’ve got it all just about done…so this summer we don’t have to do a thing! There is a little “swamp” at the bottom of the hill in our back yard…every year around this time, the lightning bugs come in droves…at night time they look like diamonds dripping down from heaven..it is the most beautiful site. So for my summer vacation I am sitting in the back yard watching the trees melt in the fire pit and watching one of the most beautiful sights that mother nature has ever provided! Camping all over Northern California, and possibly into Nevada and Oregon as well. That and spending time grilling in the backyard. House improvement can wait until Fall when it cools again (103 today)!